I’ve been buying and collecting the Topps MLB sticker albums ever since their return to shelves in 2011 (but I haven’t completed one since 2012 – help me out by looking here and trading!). 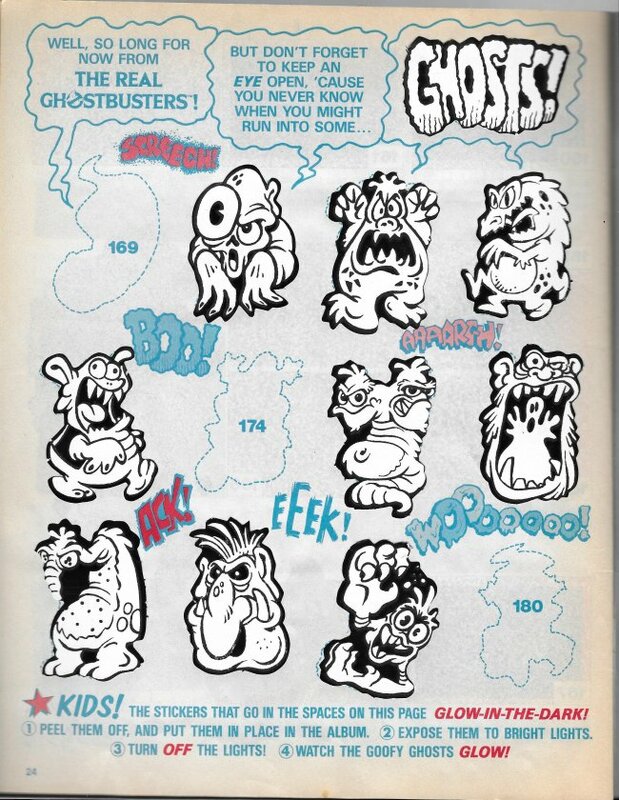 Usually it’s a fun diversion and a little bit of a nostalgia trip as I’m reminded of growing up in the ’80s where sticker albums of all types were in abundance and a good way for my parents to keep a kid occupied for a while. With this reboot inching closer to a decade of albums, I’m finding myself getting increasingly disappointed in the product. It’s very standardized, predictable, and boring. I know that it’s a budget effort, which is one of the biggest pluses it can claim, but I have some suggestions that I believe would improve the experience without significantly changing the cost and breathe some new life into it. 1) Collation – We’ll start with low-hanging fruit. Doubles are a real problem in the packs. Whether you’re ripping the smaller ones, or going for the jumbo rack pack styles, odds are way too high that you’ll get the same sticker(s) twice in the same pack. This year, I’ve only bought the 45 sticker fat packs and every single one has had doubles. If I’m lucky, it’s usually 3-5 duplicates, but that still negates the supposed savings you get by buying in bulk. At worst, I had one pack with 13 stickers that appeared twice in the same 45 sticker pack. So, 32 unique stickers before even cross-referencing my album to see if any of those were doubles. That really shouldn’t be possible and it’s not a problem unique to this year. 2) Opening Day Bonus Stickers – This is Topps’ contribution to change and it’s the one that makes me want to stop buying it altogether. This is their effort to switch things up a bit on the album. 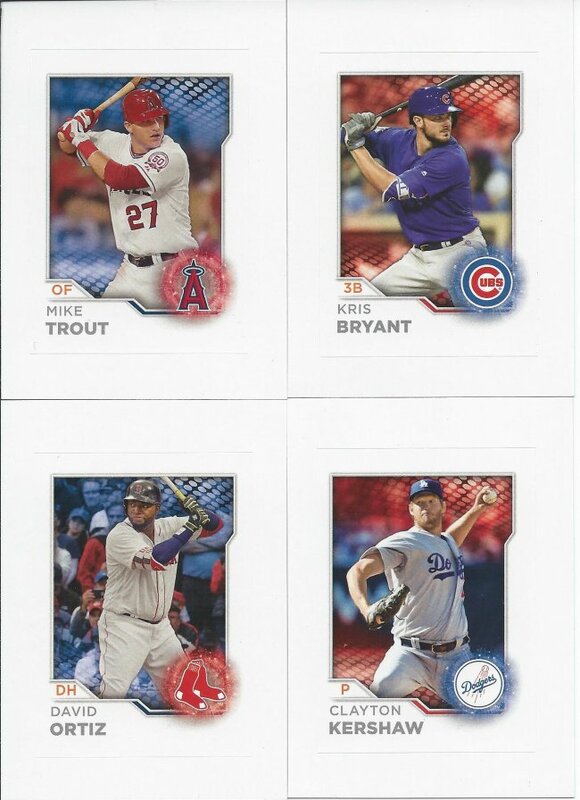 For 2017 and 2018, they added 4 stickers that can only be found inside of Topps Opening Day packs. There’s nothing wrong with that concept in and of itself. However, the OD stickers are extremely difficult to get. They are case hits. CASE HITS! For a bonus sticker that people like me will want to get to actually complete the album (because there are spaces for them), and many parents would want to get for their kids that would be less likely to understand why they have these empty spots. I like the idea of cross pollination, but make it attainable. Topps puts so many throwaway cards in packs advertising Topps Now or other projects, so why not do that with the stickers and make them usable in the albums? Expand it to 9 bonus stickers across flagship, OD and maybe another product and drastically increase the odds. No one is going to buy a full case of Opening Day to get one sticker, so the current set-up is just inviting negativity. 3) Flash it Up – Let’s see some foil. Let’s see sparkles and shimmer. Let’s see holograms! The team stickers used to have a bit of shine, now they don’t. A couple decades ago, some albums would have foil for All-Stars or other special things. 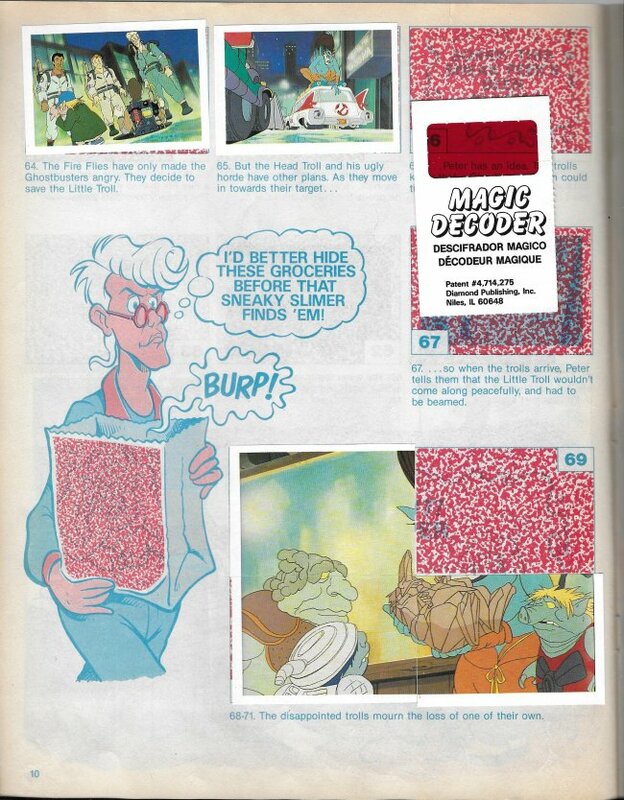 Other companies also put secret decoder glasses in their albums or blue/red 3D glasses and incorporated that printing in their non-sports albums. How about glow in the dark? It’s a little thing, but those special stickers are still fun to this guy. 4) Change the layout – There are a couple ways I would like to see this done. 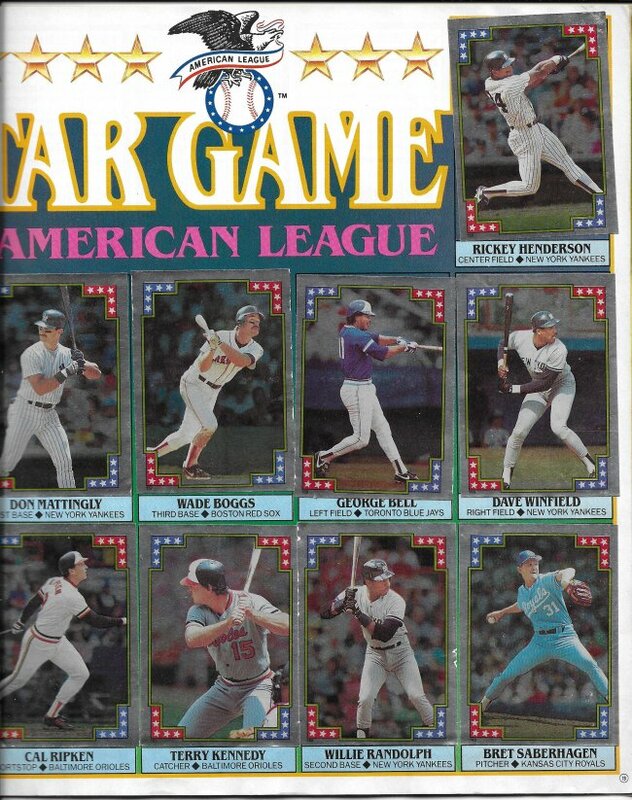 One is to expand the set size and add more pages so you can have All-Stars, World Series & Playoff pages, or stickers for other ballpark happenings. Give the mascots their own pages. What about the food, or the races like in DC or Milwaukee and Atlanta, etc? 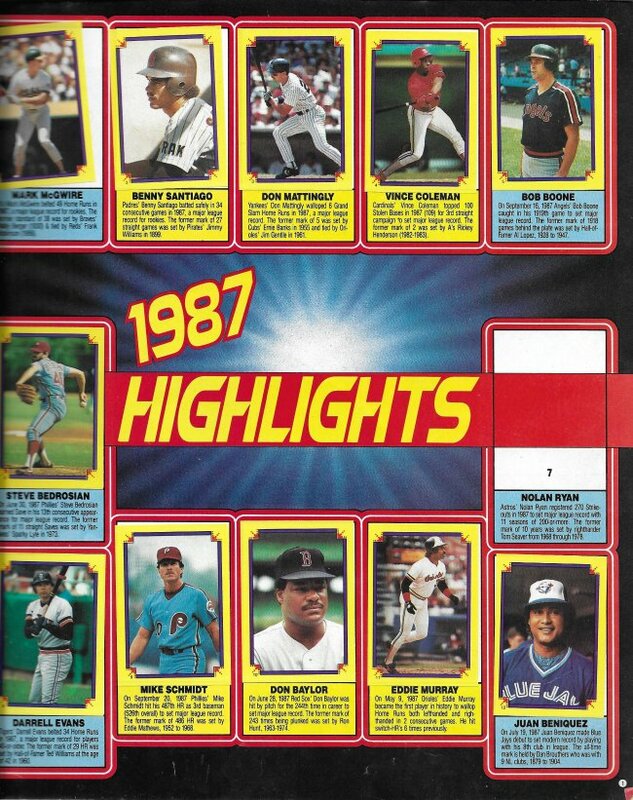 Think about the inserts in Opening Day and turn those into sticker pages. The other way would be to increase the set size by shrinking the stickers so that two players fit on one sticker the way the teams currently are set up. This used to be done. You can have more players for each team represented. You can get away from the grid layout with more space, and again it can allow for new pages with different themes. 5) Multi-Sticker Images – That leads to my next suggestion. I want to see more multi-sticker images. It used to be extremely common for albums to offer little “puzzles” where you had to get 2 or 4 or 9 stickers and put them in the album juuussst riiight in order to form a perfectly aligned picture of a player or scene. It was so satisfying to line them up. I had a lot of fun doing this in the xxxxx album with the World Series page that existed (which were also foil!!!!) but then Topps dropped it from the album for some reason. 6) Fix the sticker windows – Just about every year, it’s a guessing game as to where you should align your stickers to make them look the nicest. For some reason the border on the page doesn’t match the sticker size, so you pick a corner and go with it. I would think a simple re-measuring would fix things. This is especially problematic on the team sticker pages. Those windows are far too small and it takes some effort to plan those rows so that you have enough room. I don’t see why we should be expected to guess on something so fundamental. 7) Trade-in Program – This last one is more of a dream than anything and understandably missing. Many, if not all, albums from my youth offered this trade-in program. You would send in either money or something like 20 doubles to them with an index card/SASE listing your address and set needs and you get 5 stickers back. It’s great to not rely on trading with other actual collectors. 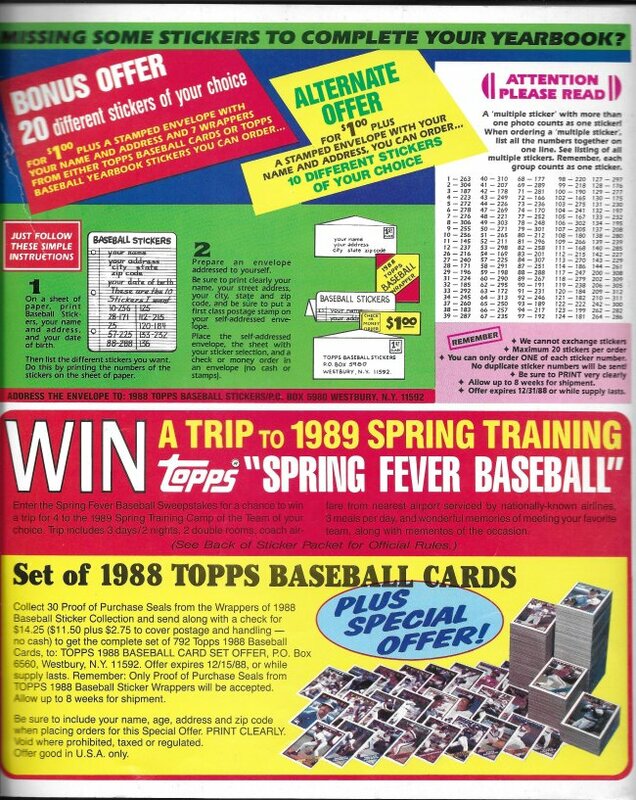 Even a program allowing people to buy missing stickers directly from Topps like you see above would be good for those that don’t have a trading outlet and are too far along to warrant buying more packs (which leads right back to point #1). So…what say you, Topps? Can we get the 2019 Sticker Album to look a little different? I’ll tell you right now, if those case hit Opening Day stickers happen again, I’m not buying a single sticker pack and will end my run.